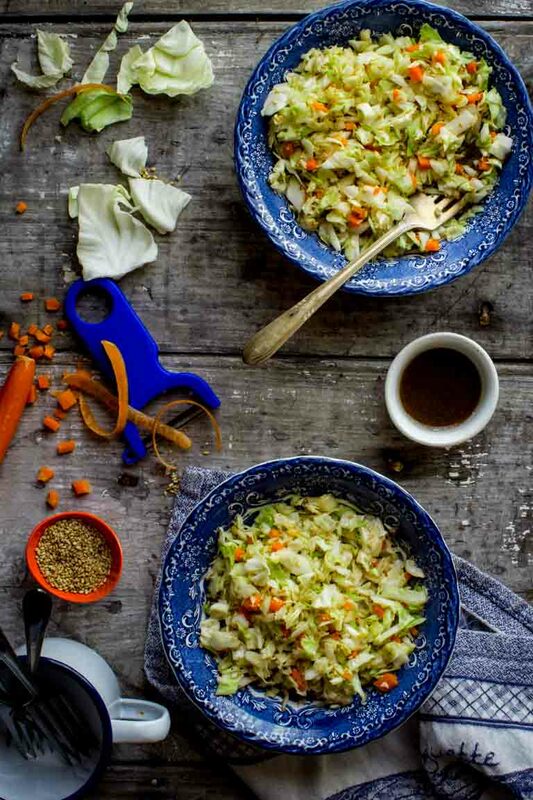 I promise this Sesame Coleslaw will be your go-to salad this Summer. 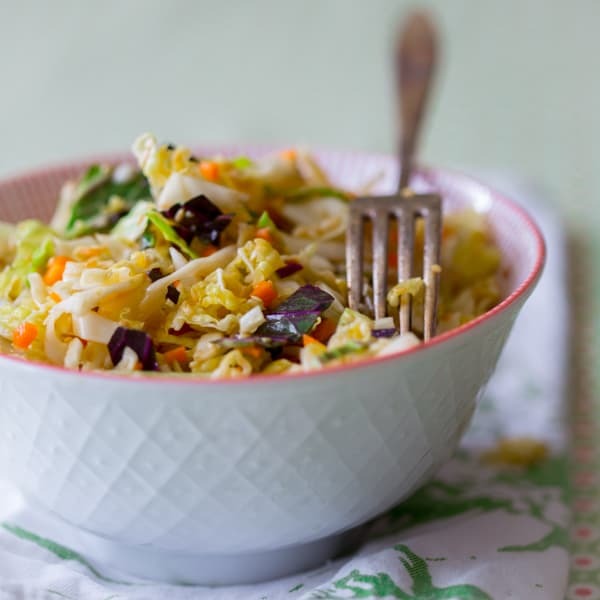 You can whip it up in just 15 minutes and the super yummy Asian flavored dressing turns the crunchy cabbage and carrots into a mouth-watering bite. Not to mention it is Vegan, Paleo and Gluten-Free! I originally shared this recipe on February 11, 2014. I have updated the images and some of the text today. Recently a reader asked what does “1 scallion, thinly sliced” mean. She was wondering if I had meant she should be slicing the scallion cross-wise into little circles, or length-wise into long strips. I told her that I had meant into little circles, and that was the end of it. But it wasn’t really the end of it, because she got me thinking about knife skills, and about the fact that I make a lot of assumptions about what is understood. We all know what assuming does, right? So today I want to clarify what the difference is between the different cuts, and hopefully make it even easier to follow the recipes here. Knife skills are so basic to cooking, that on my very first day of culinary school (after we received our knife kits) the head chef, David Hale took us group by terrified group into one of the kitchens and gave us our very first knife skills class. He taught us the NECI standard of how to dice an onion. The exact technique that I still use today. There are many many different knife cuts. This photograph is one I took for the cookbook New School Cuisine showing just a few of the different cuts. I inserted some notes so you can see the different kinds of dices. Let’s go over a few different cuts. 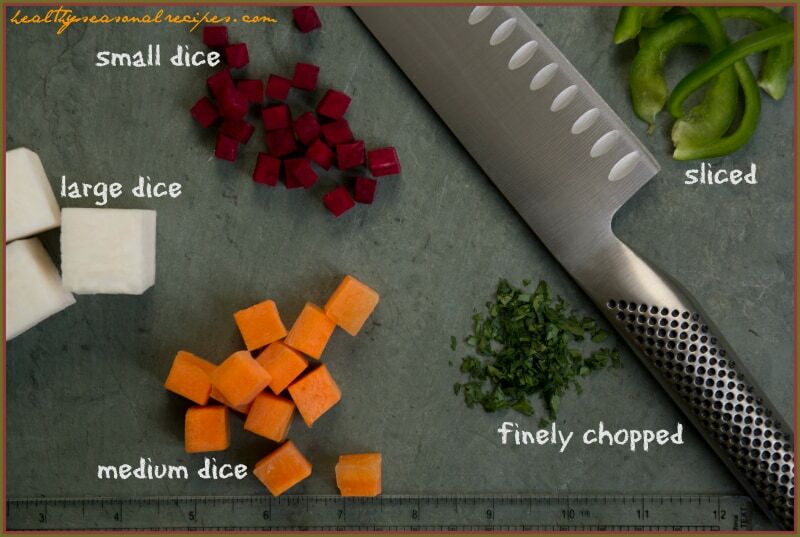 Dicing means to cut into a cube. Dicing is different than chopping because it is more precise. In the above image notice how small the ‘small dice’ is? Sometimes this is called ‘finely diced.’ The medium dice, which is about ½-inch, is pretty standard. A lot of time, when I call for ‘diced’, I don’t specify small medium or large, in that case this medium-dice is what I am talking about. The large dice on the other hand seems pretty big to me, that would be good for roasting vegetables or something that would cook for a long time like in a stew. What does Chopped mean? What is a chunk? Chopping means cutting in a more hap-hazard fashion. 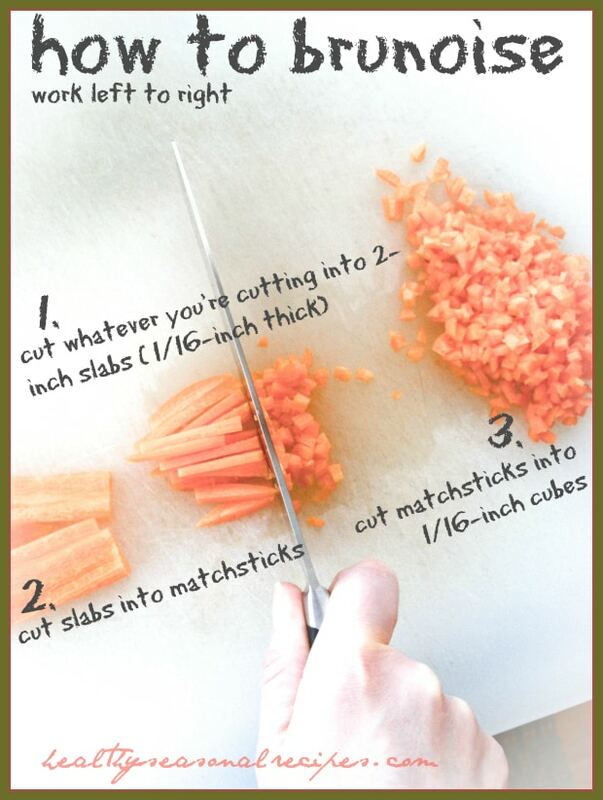 Chopping is appropriate when it is okay if the pieces cook less evenly, like for more rustic soups, or you aren’t trying to make something look fancy. When a soup is going to be pureed for example, chopping is clearly a better way to go than to make perfect cubes. I like to call for chunks sometimes too. That again means, no need to make a cube, just work with the natural curvature of the vegetable or whatever you are chunking up. Because I am a test kitchen nerd, I will also call out a specific measurement too if it really matters, like for this Potato, Kale and Andouille soup recipe, I called for 1 ½-inch chunks. That matters because if you cut the potatoes smaller they will overcook in the specified time. 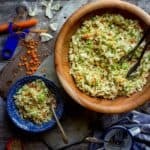 I think you’ll notice that the most common use for the chop here on my site is that I call for finely chopped herbs or garlic a lot. See the photo (on the slate) up above to see how small the finely chopped parsley looks. Finely chopped means you just keep running your knife over the garlic or herbs (as crazy fast as you can go while keeping your knife tip down) until there aren’t any big chunks left. When you finely chop a clove of garlic, some pieces will be really really tiny, and some may be just smaller than a brunoise. It’s all good. There will not likely be many perfect cubes in the pile. 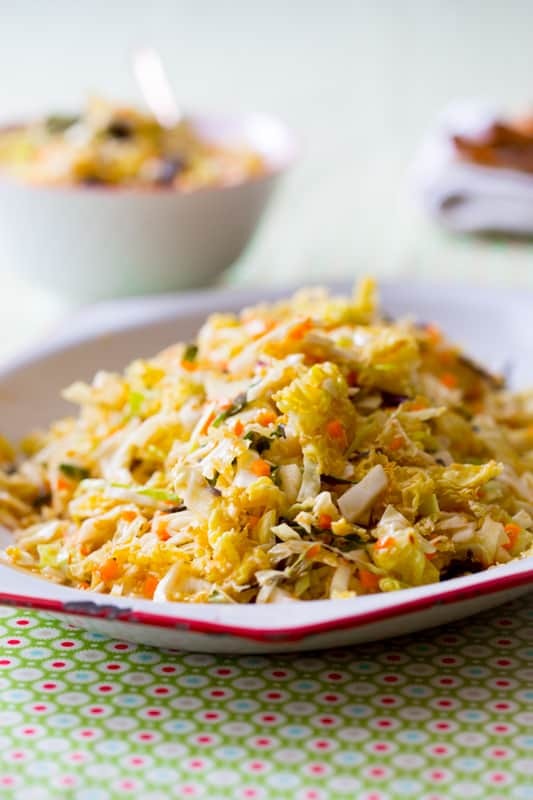 In this slaw recipe I called for finely chopped cabbage. 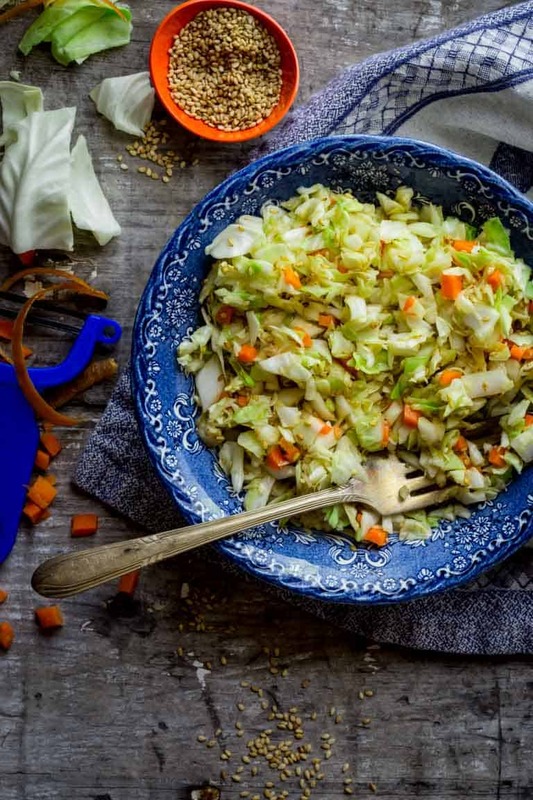 Notice that finely chopped in this case, is relative to the size of the head of cabbage. Pieces of finely chopped garlic are obviously a lot smaller than pieces of finely chopped cabbage. Which direction do I slice? Another common exception would be a bell pepper, seen on the slate above. In that case, the cook is trying to avoid the seeds, so the pepper is more commonly sliced lengthwise. For slicing meat, usually it is cut crosswise. But since there are so many cuts of meat, it can sometimes be hard to tell what that means. So in that case, a recipe may specify against the grain. 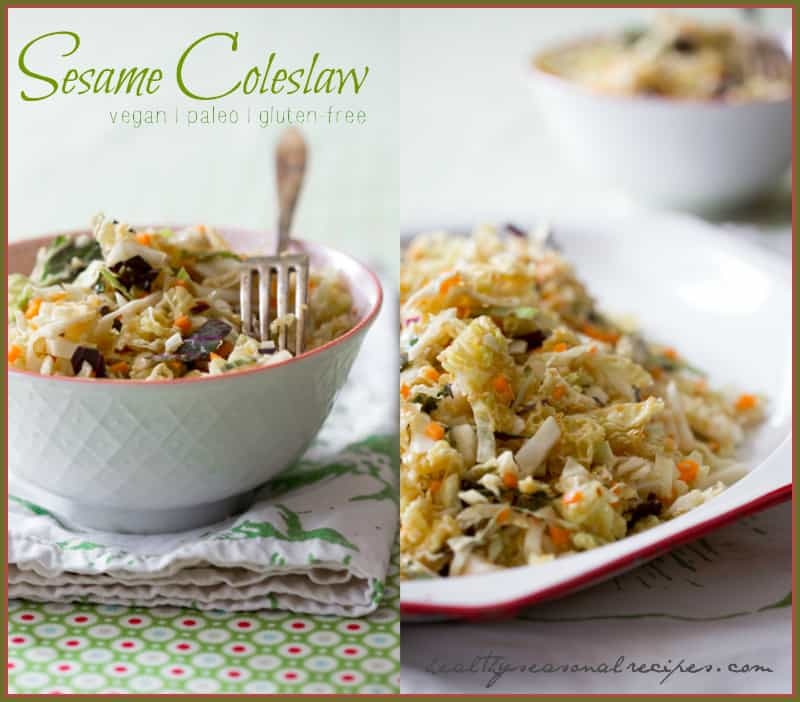 For this sesame coleslaw I cut the cabbage into slabs, and then I chopped the slabs. I wasn’t really that concerned about the perfectness of the pieces, or the uniformity. For the most part I ended up with strips and squares. The pieces are uneven but all small enough that they can get scooped up by the delicious forkful. To contrast with the rustic cabbage cuts, I brunoise cut the carrot. Maybe it is the is the food stylist in me coming out. But I really love seeing those neat little cubes of carrot dancing around in the rustic mixed cabbages. PS–> If you’re looking for a recipe to serve this Sesame Coleslaw with, try it with short grain brown rice and these uber delicious Korean BBQ Meatballs. Whisk vinegar, maple syrup, tamari, flax oil, avocado oil, sesame oil, salt and pepper in a large bowl. 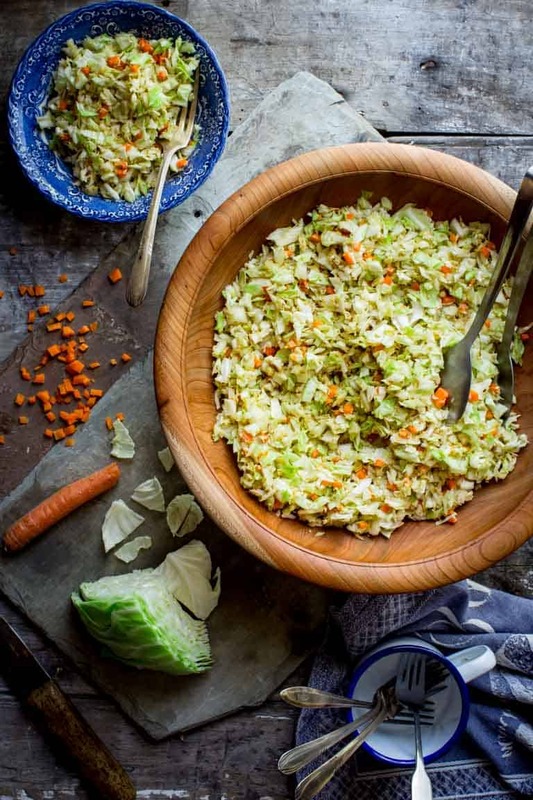 Add cabbage, carrots and sesame seeds and toss to coat. **Ingredient note: to make this PALEO, substitute coconut aminos for the tamari. *Ingredient note: Flax seed oil, or FLAX OIL is a great source of plant-based omega-3 fatty acids. 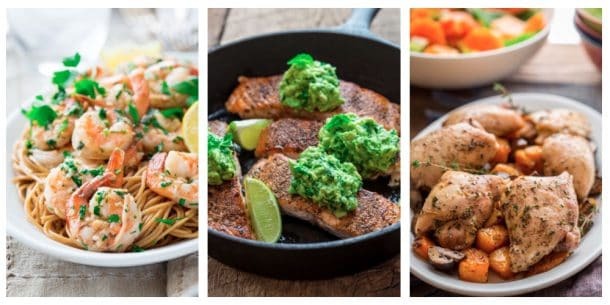 Getting more omega-3s in our diet is super- important for combatting inflammation. Flax oil can be found in the refrigerated section of health food stores and large supermarkets. It is heat sensitive, so don’t cook with it and be sure to store it in the refrigerator. 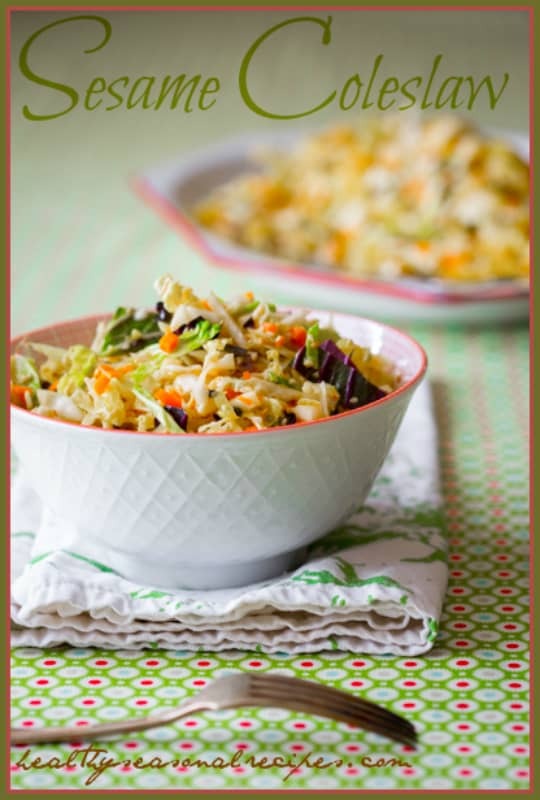 It has a slight nutty/fishy flavor, so it is best when paired with bold flavors like those in this dressing. I love the idea of piling this onto a turkey burger Christine. That is a great idea. Ahhhh yes, this post instantly takes me back to my first class of culinary school. I even had a little 3-D card that had models of all of the knife cuts. 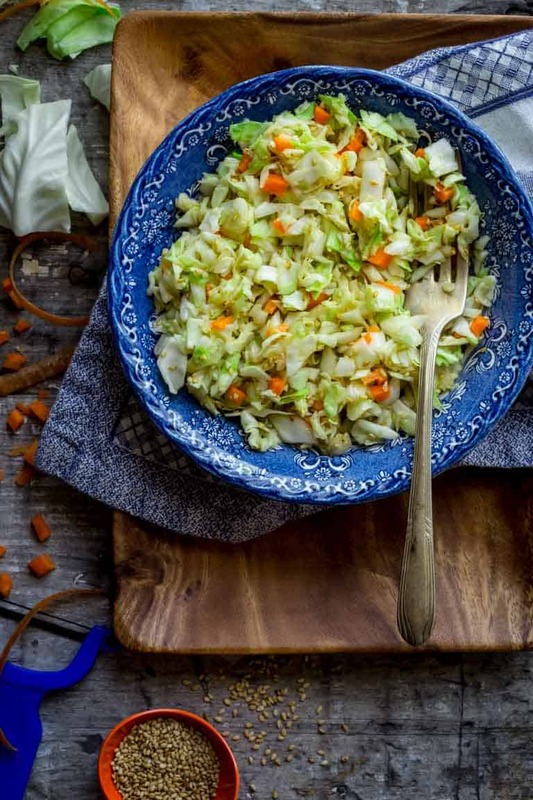 Also – beautiful coleslaw. These are the kinds of flavors I am ALWAYS craving at lunchtime. Thanks Lori. That card sounds sweet. I don’t think we had anything like that. I am a salad for lunch kinda girl most days, especially if it has good dressing. 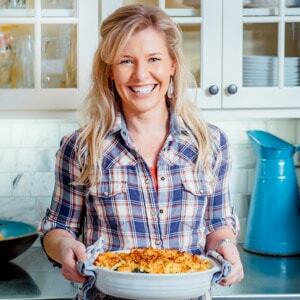 This looks great Katie, and I love the knife lesson! You always put so much helpful information in your posts!! Thanks for the knife lesson. It’s very enlightening. Thanks Joshua, my hope is that for someone like you you’d find this post helpful to share with your students or to help clarify the differences. How helpful — thank you the approachable info! Also, your photography is beautiful. Aw thanks Hannah. I am glad you find this helpful/useful. That makes me so happy. I love this post. I think if we’ve been cooking for a long time, we assume that readers know what we mean when we specify something is second nature for us. Makes me realize I need to be clearer when I write a recipe. I wish I could have gone to culinary school, but I never wanted to work as hard you have to in the food industry! Thanks Bill, I agree totally about assumptions. I tend to sometimes err on the other side and include waaaay too much info in a recipe, which can make them seem long and complicated, when they aren’t. Culinary school was amazing, and I would do it again if given the choice, I learned so much. But I agree about the food service industry, it was hard and I never got to see my family. That’s a great lesson in knife skills – makes me think, I really need to get myself a properly sharp knife. I watched a couple of demo videos on youtube recently and quickly realised why I struggle with cutting small and fast! And I must try this recipe too – sounds delicious. I must admit to still buying ready made coleslaw sometimes, I don’t know why, it’s just not the same (not to mention what strange ingredients may be hiding in it!). A sharp knife is so important. I need to sharpen mine right now. It makes cooking so much more enjoyable, doesn’t it? No worries about the coleslaw Ian, the way I see it is that it is a bag of cabbage. It isn’t like Doritos or something. Thanks so much Pamela! Have a great day! I’m so glad I just found this blog today. I’m the cook in the household, and my wife and I just started getting a CSA veggie share box, so often times there are things in there I’ve never cooked before. I’m trying a slightly altered version of one of your beet green salad recipes later tonight, but this looks amazing! Will almost certainly make it this weekend for a Fourth of July BBQ. Also, shout out from Philly! Welcome Michael! I love that beet green salad- I would have never thought that possible long ago- since I thought I hated them. Now I am growing extra beets to ensure that I can make that! Ha ha. Let me know how the recipe goes, and if you ever have questions feel free to email me! Happy Cooking! We love trying different coleslaws! Love the Asian flavors of this one! Same! I love bringing a twist on the classic to a BBQ. Hope you like this Jessica.